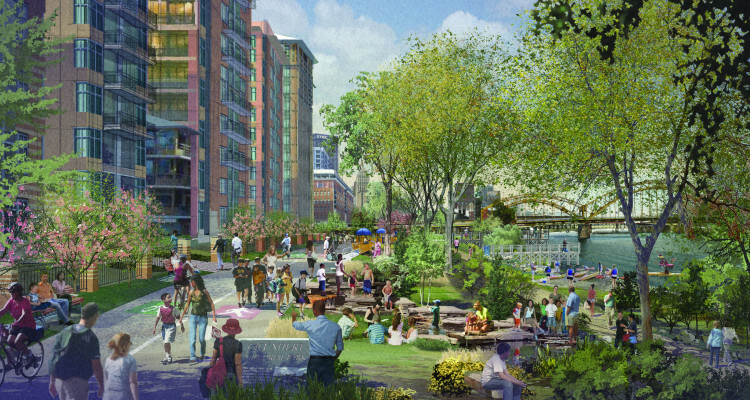 Rendering to inspire Strip District Riverfront Park, by Ed Dumont for Riverlife. 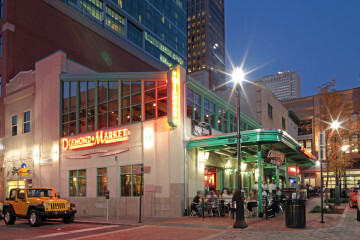 The American Architectural Foundation (AAF) chose eight organizations nationwide to participate in the 2015 Sustainable Cities Design Academy, which provides development and design assistance for sustainable building projects. 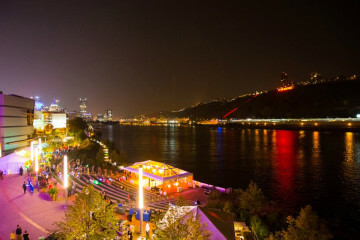 Pittsburgh was the only city to have two teams selected: the Urban Redevelopment Authority (URA) and Riverlife. “We were really impressed by the projects they put forward,” says Elizabeth Okeke-Von Batten, program director of Sustainable Cities Design Academy (SCDA). Teams are chosen for work on a specific project. The URA—in partnership with the City of Pittsburgh Planning Department and McCaffery Interests—was named a grantee for the Produce Terminal/Smallman Street project. “Our team hopes to gain a fresh perspective on this site and utilize the technical expertise of the SCDA to create a design that serves all of the current and future uses, needs and visitors interacting with this building,” says Rubinstein. Riverlife—in partnership with Oxford Development, Friends of the Riverfront, Neighbors in the Strip and the Pittsburgh Water and Sewer Authority—was selected for the Strip District Riverfront Park project. This is a model of collaboration between the city, a developer and three nonprofits. Much of Riverlife’s quest to build Three Rivers Park—which stretches from the 31st Street Bridge to the West End Bridge to the Hot Metal Bridge—has dealt with public land, but the work the Strip District Riverfront Park encompasses is a patchwork of (mostly) private land owners. “We are working with all of the property owners to develop consistent design elements like lighting fixtures, open space, trail networks, access to river and the perpendiculars back into the community,” says Addy Smith-Reiman, project manager at Riverlife who will be attending SCDA. The groups will visit AAF’s headquarters in Washington D.C. for intensive, three-day design charrettes to receive leadership training and technical assistance. Two charrettes will be held. Riverlife will attend in June, the URA in August. Each grantee will bring four or five stakeholders from both the public and private sector—this helps provide a healthy balance of perspectives, says Okeke-Von Batten. Grantees will meet with a team of experts “to help them think about best practices and the phase-implement strategy to help projects move forward,” she says. “We invite designers of national renown, and we hand select them for the needs of each project,” she explains. The experts—who do this work pro bono—might come from the fields of architecture, planning, real estate development, engineering or preservation. Green infrastructure: for Riverlife, this examination will include storm water on site and for the URA, they’ll look at the historic structure of the Produce Terminal and its rehab. Stakeholder and community engagement asks: Is there a good feedback loop to help make the projects the best they can be? Financials: This examines the money set aside and costs for maintenance going forward, so it looks at both short- and long-term costs of the project. Previous Pittsburgh grantees were the URA/Larimer Neighborhood Association in 2010, which studied the open space in Larimer. Last year, the Saw Mill Run Integrated Watershed Management study explored the Rte 51/Saw Mill Run corridor in an area “notorious for flooding,” says Okeke-Von Batten. It was a partnership between Economic Development South, Pittsburgh Water and Sewer Authority and the city of Pittsburgh. This year, it’s all about the Strip.